Three words that best describe Erika are: Honest, Reliable, Caring. When you sit down in Erika’s chair, not only do you get pampered and receive an exquisite haircut, you also become drawn to her charismatic nature. Her compassion for her guests is superior and when they leave the salon, they become her friend and a part of her family. 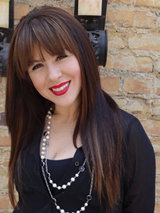 Erika finds enjoyment in working with current trends and creating cutting edge haircuts and colors for all lengths. She likes working with Aveda’s versatile color line to customize colors to fit her guests’ personalities. Erika started her journey as a stylist at Citrus College. She is passionate in continuing education classes and expanding her skills. Many of her skills include hair extensions, color corrections, haircuts, Brazilian blow-outs, Keratin treatments, and hair for special occasions (updo’s). Erika gives each guest an enjoyable experience and values the relationships she builds and maintains with her guests.